Every Mailchimp list comes with a flexible, customizable signup form that will help you grow your subscriber base. We call it our hosted signup form, because we publish it on our servers. Decide what information you want to capture from your audience, customize the look of your form, share the URL across your online channels, and we'll handle all the rest! 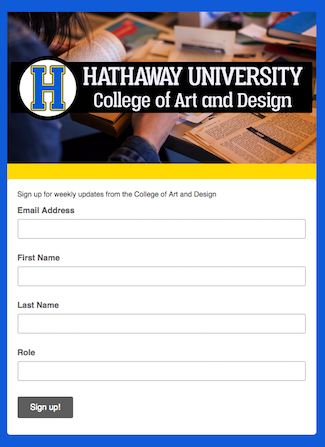 In this article, you'll learn how to create a hosted signup form. We automatically generate a signup form for your Mailchimp list. This form isn't visible to others until you decide to share it. Your default signup form has a simple gray and white design, and you can use it right away if you want. Or, you can use the Form Builder to customize it to fit your style and brand. Here's an example of a default signup form, before and after it's customized in the Form Builder. Read on to learn how to customize your own signup form. All the action happens in the Form Builder, in the Lists section of your account. To access the Form Builder, follow these steps. 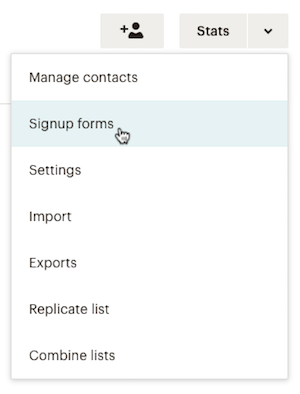 In the Forms and response emails drop-down menu, you'll land on the Signup Form by default, but you can also choose another page or email to edit. Once you're in the Form Builder, these three navigation tabs help you find your way around and accomplish certain tasks: Build it, Design it, and Translate it. In the following sections, we'll show you how to use the tabs to edit your form, emails, and pages. On the Build it tab of the Form Builder, you can add or remove form fields, customize text, and add a message to the top of your form. 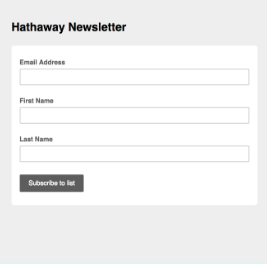 In this example, you'll learn how to customize your greeting message, and add a new text field to your signup form to collect extra information from subscribers. Navigate to the Build it tab of the Form Builder. Doubleclick the click to add a message field, and type your greeting message. Click Save and Close when you're done. Next, you'll add your new field. Choose a field type from the Add a field menu. 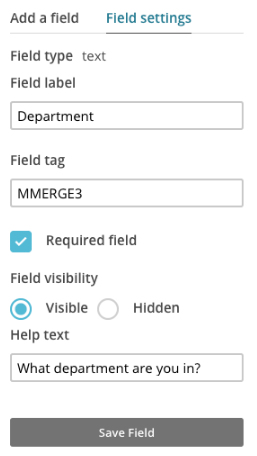 Click Field Settings to edit your field's label, merge tag, help text, and default value. Click Save Field when you're done. Well done! Now you're ready to put your own spin on the form design. On the Design it tab of the Form Builder, you can make your design more exciting with custom colors, fonts, or images. In this example, you'll learn how to change the form's color scheme, and replace the header text with an image. Navigate to the Design it tab of the Form Builder. Click to open the color picker. 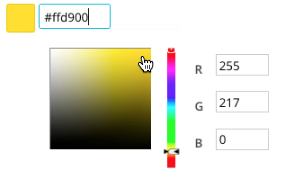 Click the color hue and saturation you want for the background color. Your changes will save automatically. Next, click Outer Wrapper to add a band of contrasting color to your form. 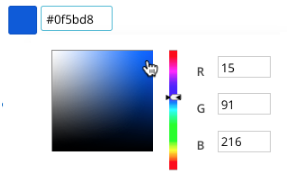 Click to open the color picker, and select the hue and saturation you want. When you're ready to insert your header image, hover over the header of your form, and click Use image. Upload an image from the Content Manager, and click Select. Set image proportions, and click Save & Insert Image. All set! Now that you have a customized signup form, you're ready to move on to the Translate it tab. On the Translate it tab of the Form Builder, you can set your default language, turn on auto-translate, customize default form text, or change text direction. In this example, we'll show you how to change the default text of a the Subscribe button on your signup form. Navigate to the Translate it tab of the Form Builder. Click the field next to Subscribe to list, and type your custom or translated text. Now your signup form is totally customized. Read on to find out how to share your signup form, monitor form success, and boost your skills even more. Ready to move on to the next steps? Here are some things you can try to help your new subscribers have an even better signup experience. Share your signup form across all your online channels. Monitor form success with subscribe notifications or list statistics. Use merge tags in your signup response emails to greet your new subscribers by name. Try a few different types of signup form at once. Advanced option for developers: use our powerful API to build a signup form from scratch.